"Everything's done and dusted," said Lapinette. "I'm sure they'll all agree," added the Wabbit. The meal had been good and the Wabbit stroked his tummy. That was when he looked down and noticed the cherry. It was red and bright and one of a pair. The two pranced over the cobbles like ballet dancers and hummed. The Wabbit sighed suspiciously and murmured, "What do you want?" "Nothing," said the cherries. They danced merrily off. "Who were you talking to?" asked Lapinette. 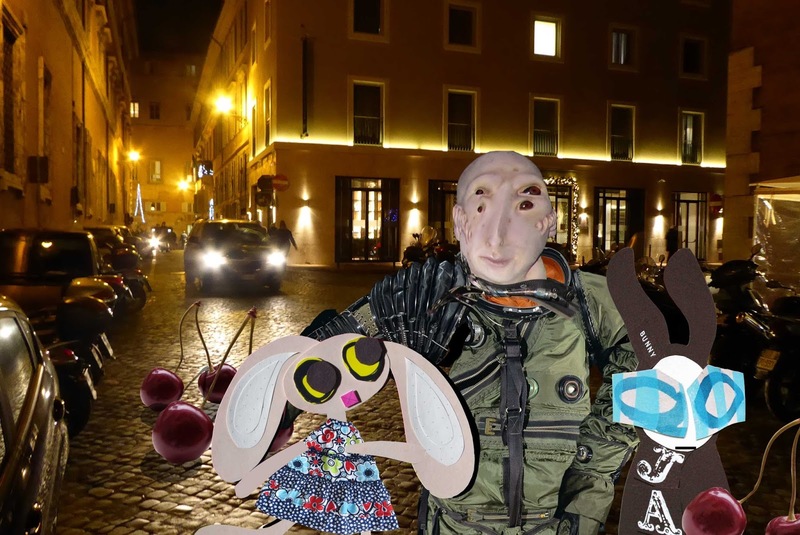 "Two cherries," replied the Wabbit. Lapinette shot him a quizzical look, then sighed too. "What did they want?" "Nothing," said the Wabbit. The Alien Pilot was uneasy. His eyes flicked behind him. "I don't like the look of these cherries. They're after something." "Nope," shrugged the Wabbit. "Maybe they're stoned?" ventured Lapinette. The Wabbit shook his head. "They don't look stoned." They watched the cherries wander aimlessly around, humming and cheerfully chatting. "I changed my mind," said the Wabbit. "And I had an idea," said Lapinette; "We'll ask the cherries to help mediate between the tomatoes and the strawberries." The Alien Pilot breathed a sigh of relief. "Perfect," said the Wabbit. His 28 teeth glittered. "I'll pick some cherries out." 8. 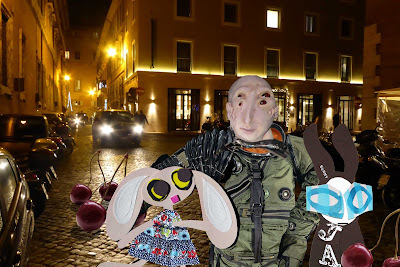 The Wabbit and the Grape Break.